Cover more ground on this Segway tour of Savannah's historical areas, including a walking portion in the Colonial Park Cemetery. Glide past colonial-era homes, through Savannah's famous squares, and under trees lined with Spanish moss as your guide fills you in on the history of Georgia's oldest city. 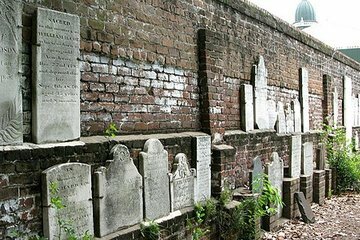 Then, head to the cemetery for a walking tour of some of the South's most famous residents' final resting places, including signers of the Declaration of Independence. I stupidly did not pay attention to the segway in this tour. I could never handle this. I am a klutz. I would not recommend this for people like me...I'm sure those who can handle Segways would love it.